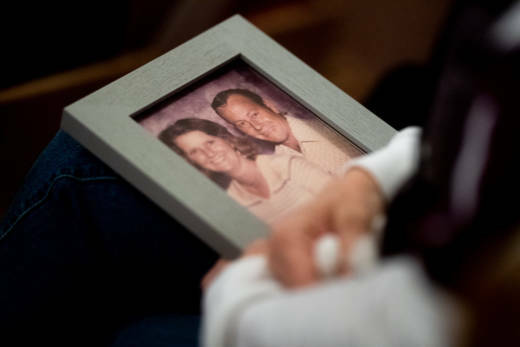 SACRAMENTO, Calif. (AP) — Authorities are using a powerful tool in their effort to identify the scores of people killed by the wildfire that ripped through Northern California: rapid DNA testing that produces results in just two hours. The system can analyze DNA from bone fragments or other remains, then match it to genetic material provided by relatives of the missing. But the technology depends on people coming forward to give a DNA sample via a cheek swab, and so far, there are not nearly as many volunteers as authorities had hoped for. As of Tuesday, nearly two weeks after the inferno devastated the town of Paradise and surrounding areas, the number of confirmed dead stood at 79, and the sheriff's list of those unaccounted for had about 700 names. But only about 60 people had provided samples to pop-up labs at the Butte County Sheriff's office in Oroville and an old Sears building in Chico, where the Federal Emergency Management Agency set up a disaster relief center, said Annette Mattern, a spokeswoman for ANDE, the Longmont, Colorado, company that is donating the technology. Confusion and conflicting information, the inability of relatives to travel to Northern California and mistrust of the government may be contributing to the low number. Tara Quinones hadn't heard anything from her uncle, David Marbury, for eight days before she drove north from the San Francisco Bay Area to give a sample Friday. A worker used a small tool to scrape her cheek, took three swabs of skin and asked her detailed questions about who she was looking for and their relationship. The uncle's landlord confirmed his house burned down with his vehicle still in the garage, but Quinones had no idea if any remains were found. Marbury's name keeps going on and off the ever-changing list of the missing. "I did it just to be proactive," Quinones said Monday. "This is the one way I could contribute to helping find my uncle." Some of those who have given DNA came forward, like Quinones, after learning about the identification effort in their desperate search for a loved one, others after the sheriff's office called to say that remains that probably belonged to a family member had been found. Mattern declined to say Tuesday how many victims ANDE's technology has helped identify. Sheriff Kory Honea's office did not immediately respond to requests for comment. The fire was 70 percent contained Tuesday. Rain in the forecast for Wednesday through Thanksgiving weekend could aid in fighting the fire but could also bring flash floods and complicate efforts to recover remains. Once DNA is extracted from the remains, it is placed in a vial that goes into a black machine that looks like a bulky computer printer. It takes just two hours to process the material and get a DNA profile; traditional methods can take days or weeks. If a relative's DNA is already in the system, a match will pop up right away. Mattern said it has been surprisingly easy to get DNA from remains, despite the devastating damage done by the flames. "We went in with pretty measured expectations, we didn't know what we were walking into," she said. "We have a tremendous database now of the victims of the fire." Ruth Dickover, director of the forensic science graduate program at the University of California-Davis, said that scientists have long been able to extract DNA from bone — a process that involves pulverizing the bone — but things can become more complicated if the remains of multiple people are mixed together. "What's left may not give you a nice beautiful profile," she said. ANDE won a contract in 2009 to do research and development for federal agencies, and the company's technology has been used in pilot programs for several years. Over the summer, it won FBI approval for use in accredited labs. Law enforcement agencies in Utah, New York and Miami have used the technology, as has the military. This is the first time ANDE has helped identify victims after a natural disaster. The company has donated seven machines and about a dozen workers to the effort. Sarah Warren drove an hour and a half from Redding on Monday to report her uncle, Devan Ruel, as missing. The sheriff's office gave her a number to call about missing people, and when she called, she was told authorities would contact her if they needed her DNA, she said. She said no one told her about the collection desk at the old Sears, so she returned home without providing one. "I could have done that so easily, just to be safe," she said. Warren hadn't talked to Ruel in about eight years and said the family did not have an address for him. "He was just an off-the-grid type of guy," she said. "If he did perish that way it would be horrific. It deeply, deeply saddens me to even consider that being a possibility." Mattern said the sheriff's office is looking for a way to make it easier for families who don't live in Northern California to provide samples. And in hopes of easing fears that the DNA will be misused, the sheriff's office and the company gave assurances it will be deleted once it is no longer needed.